I left off last time at the beginning of Marilyn finally agreeing to fly pairs with me. The intention was to have a go at some of the winter leagues and see how we liked it before, maybe entering the STACK competitions. 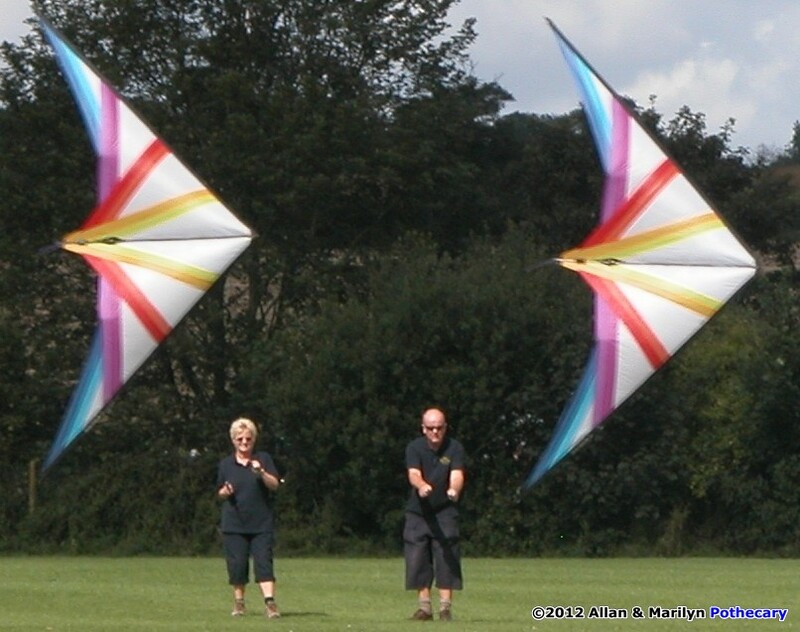 An example of how kiting can help you in other ways, Marilyn was extremely shy of doing anything where lots of people were likely to be looking. It never bothered me after years of playing in pop groups semi professionally but I struggled even to get her to help me with an altitude sprint! Now she has the confidence to stand on her own, sometimes in front of hundreds of people, flying two or four line routines without a second thought – proud of her or what? Going back a bit, I’d bought myself a lovely blue coloured Benson Phantom and then fell in love with a fantastic looking one in orange and grey/black these were full size kites which flew slowly and also didn’t need much wind to get them going – quite advanced for their day and still a nice kite now! 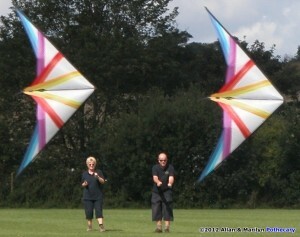 We took the two down to our local field (now a housing estate!) and slowly plucked up the courage to have them both flying together. We agreed a plan of both flying across the window from opposite sides so that we would cross in the middle. We knew nothing about how to set this up and flying follow infinities were way beyond our comprehension at that time. All we had fixed in our minds was that I was the bottom kite and would go DOWNWARDS if we looked like hitting each other and Marilyn was the top kite going UPWARDS if needed. We crossed, brilliant! – and – OMG – we have to get back now – quick! – remember which kite you are! “Which way do I go if we’re too close?” too late to think now we had already crossed back again and absolutely buzzing as the adrenalin smacked in. OK, settle down – we’ll do it again. This time was just as wobbly but had the same effect on us both! We didn’t get down to the field for a while after that for some reason and we had an early holiday coming up. I couldn’t wait to see these lovely things assembled, so I did so in the hotel room and easily managed to put a spar right through the sail – not even flown! That’s one of the reasons I have a video in the “Tips” section of our website to help others, like me, who don’t do fiddly! One of the videos shows me assembling a kite (a Benson Deep Space) and the other dissembling. My son Grant, of “Special Media Projects”, knows little about kiting but a lot about film and television production put both videos together in one take and remembered enough from what I had said during filming to add the commentary – No – it’s not my golden tones! This entry was posted in General Topics, Kite Columns, Kiting Experience, KL Archive and tagged NSR, pairs.